THE STATE OF AMERICA’S VOTING RIGHTS, IN ONE MAP | "Global Possibilities"
The Supreme Court announced on Wednesday that it would not reinstate North Carolina’s comprehensive voter suppression law, and the big headlines out of this announcement rightly touted this decision as good news for voting rights. Just below the surface, however, this order has ominous news for many Americans. In 2016, a voter’s right to the franchise — even when that right is protected by the Constitution itself — may not amount to much if they do not live in the right state. Shortly after the Supreme Court gutted a key provision of the Voting Rights Act in 2013, North Carolina enacted an omnibus voter suppression law which combined many voting restrictions — including voter ID, cuts to early voting, and barriers to voter registration — favored by conservatives. Moreover, as a federal appeals court explained in its decision striking down many provisions of this law, the state specifically designed the law to target “practices disproportionately used by African Americans” while mitigating its effects on white voters. The North Carolina law is, in other words, one of the most clear cut voting rights cases to reach the Supreme Court in many years. The timing of the law is suspicious, as it came into being immediately after the state was no longer subject to federal supervision to ensure that it wasn’t engaged in racist voting practices. And a federal appeals court determined that, yes, this law really was enacted for the very purpose of disenfranchising black voters. Though most members of the Court’s conservative bloc tend to be skeptical of lawsuits alleging that a law has a disparate impact on people on people of color, even they ostensibly still acknowledge that intentional efforts to discriminate against black voters are wrong and unconstitutional. And yet, all four of the Court’s conservative members voted to reinstate the lion’s share of North Carolina’s voter suppression law. If Justice Antonin Scalia were still alive, it is all but certain that North Carolina’s plan to restrict black voting in 2016 would have succeeded. As election law expert Rick Hasen notes, the practical impact of the Supreme Court’s North Carolina order is that it “really empowers the lower courts.” If the four conservative justices are unwilling to halt this of all voter suppression laws, then it is unlikely that they will be offended by other voter suppression efforts in other states. With only four votes at their disposal, however, the conservatives are no longer able to disturb a lower court’s order unless a member of the Court’s liberal bloc shares their desire to do so. Below is a map of the federal appellate circuits, the level of federal court below the Supreme Court, which predicts how these courts are likely to vote in voting rights cases. Dark blue circuits are dominated by left-of-center judges and are likely to be strong supporters of voting rights, while dark red circuits are the opposite. 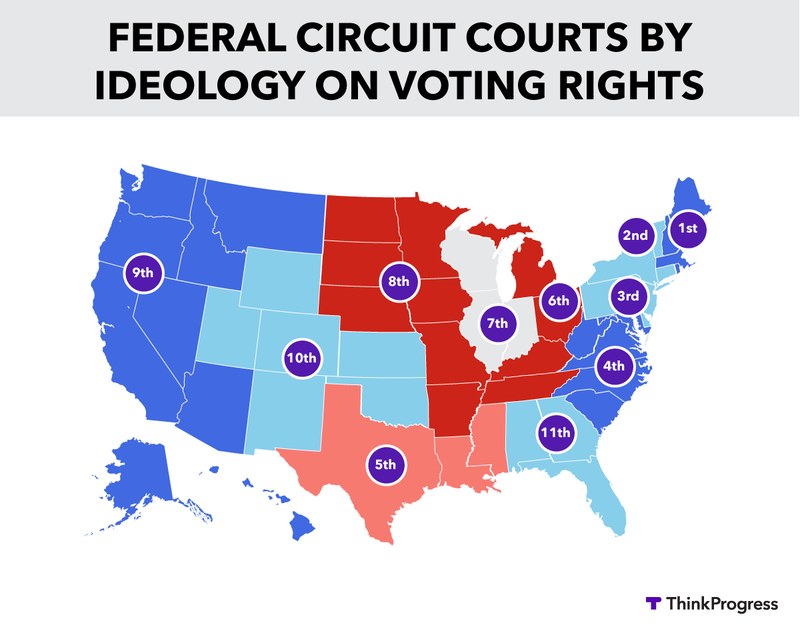 Lighter colored circuits still lean to the left or to the right on voting rights, but are more ideologically mixed. In coloring this map, I made several judgment calls. The Seventh Circuit, for example, is colored white because, although a majority of its judges were appointed by Republicans, two of its GOP-appointed members have broken with their more conservative colleagues in at least one major voting rights case. The Eleventh Circuit is colored light blue, despite the fact that Democratic appointees enjoy a significant advantage, because several of the judges on this court were appointed due to a compromise between a Democratic president and Republican senators — and at least one of these appointees is very conservative. The Fifth Circuit is coded light red because, although Republican appointees dominate this court, the full court recently held that Texas’s voter ID law violates the Voting Rights Act. Three additional factors are worth noting. The first is that most appeals are heard by a randomly selected panel consisting of only three judges. Thus, liberal panels often form in conservative courts and conservative panels often form in liberal courts. Though a process does exist that allows an entire appeals court to reconsider a three-judge panel’s decision, this process is rarely invoked and is often time consuming. Accordingly, the fact that a particular circuit is coded deep red or deep blue does not prevent that circuit from producing an unexpected decision, especially if the decision is handed down by an atypical panel. 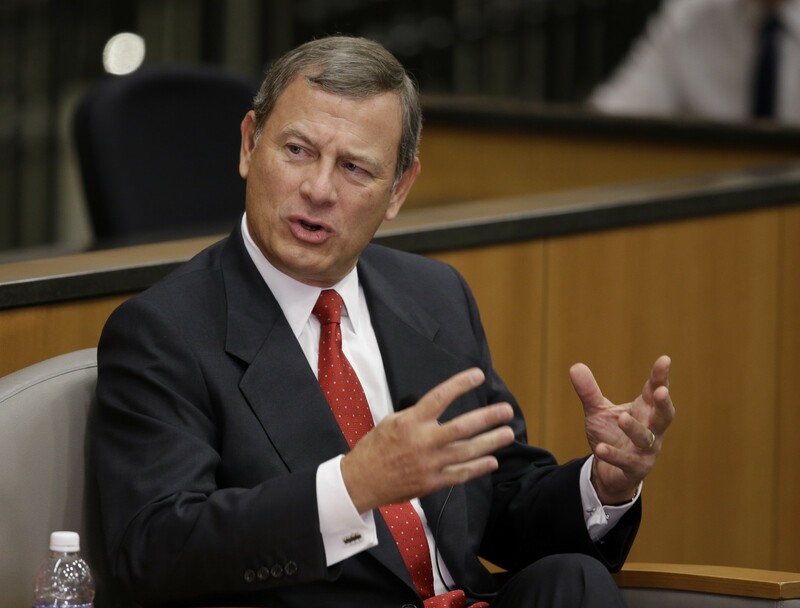 The second is that, in Purcell v. Gonzales, the Supreme Court warned that “Court orders affecting elections can themselves result in voter confusion and consequent incentive to remain away from the polls,” and that “as an election draws closer, that risk will increase.” Accordingly, the justices grow more likely to leave the status quo in place, whatever that status quo may be, as an election draws closer. In recent elections, the Court’s conservative bloc has been quicker to invoke Purcell than its liberals, but it is likely that there will come a point when the election is so close that the justices will be especially reluctant to let lower court decisions disturb state election rules. The third is that there is some correlation between conservative circuits and conservative states that are especially likely to enact voter suppression laws. An arcane and antiquated Senate practice known as the “blue slip” allows senators to veto federal judicial nominees within their state. This enables Republican senators to exert rightward pressure, and Democratic senators to exert leftward pressure, on the federal courts that oversee their states. The blue slip practice, for example, partially explains why the Eleventh Circuit, which includes the crucial state of Florida, is not an especially liberal court despite the fact that 8 of its 11 active judges were appointed by Democratic presidents. It also forces President Obama to seek permission from Sen. Ted Cruz (R-TX) before he can fill two vacancies on the conservative Fifth Circuit, or to get permission from Senate Majority Leader Mitch McConnell (R-KY) before he can fill a seat on the conservative Sixth Circuit. Indeed, while Obama’s two terms have enabled him to reshape much of the judiciary, conservatives still control the federal courts that oversee a number of important swing states, including the often-pivotal state of Ohio.